Haenyeo is an exhibition featuring works by photographer Hyung S. Kim. 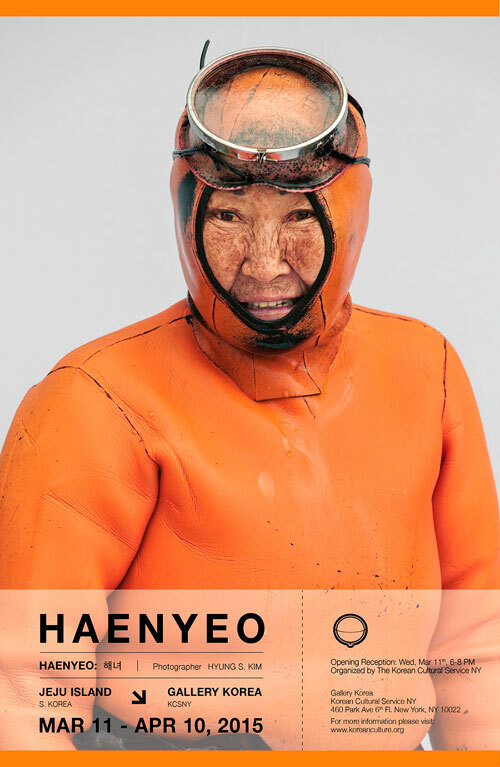 The title, Haenyeo, refers to the female divers who harvest seafood by diving into the ocean without diving equipment or breathing apparatus. 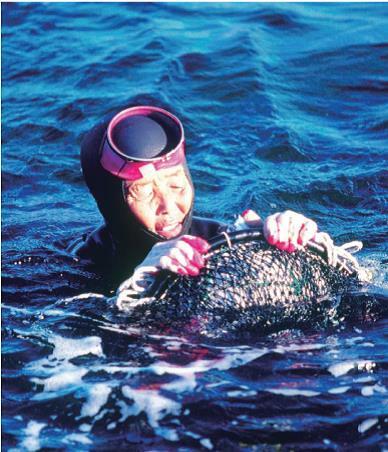 The haenyeo culture is Korea’s unique indigenous cultural heritage that has a history that goes back to the primitive age when people began to dive for food in the sea. The haenyeo have been noted in literature since 1105. 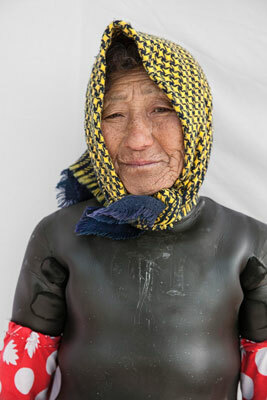 The life of haeneyo begins when a girl turns 15 or 16 after receiving training in swimming and muljil (which refers to the actual work of underwater harvest), and their practice continues until the age of 60 or even older. Most haenyeo reside in Jeju Island, located in the southern end of Korean peninsula. Since 2013, the Cultural Heritage Administration of Korea has been pushing to get haenyeo registered by the UNESCO as an Intangible Cultural Heritage of Humanity. 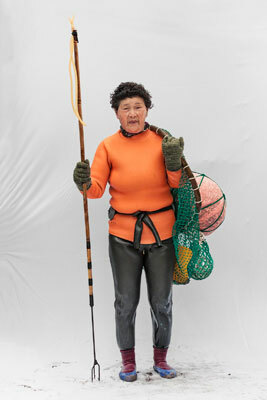 This distinctive practice of female diving culture is one of Korea’s prime intangible assets. The exhibition, Haenyeo, presents photographic works by Hyung S. Kim who captures the true reflection of haenyeo’s everyday life on Jeju Island. This photographic collection has been in production since 2012, when Kim became fascinated by the historical background and distinct characteristics of haenyeo. He has since been residing on the Island to produce a photographic collection of the extraordinary women. Kim’s works express the joys and sorrows of the lives of haeneyo as well as their history. He photographs of them in their most natural states. 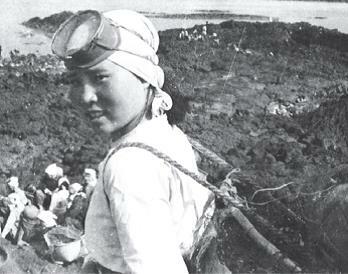 In addition to the works by Kim, the exhibition will display documentary photos and video materials depicting the life of haenyeo – their uniforms, tools, and diving practices. This will allow the audience to more fully understand the culture, history, and life of haenyeo, a precious cultural asset of Korea. 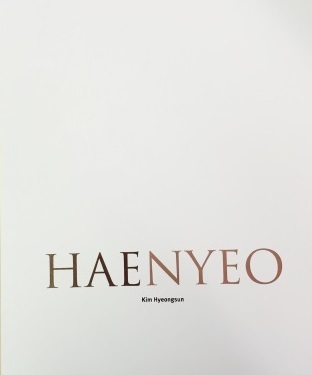 Photographer Hyun S. Kim’s catalogue <Haenyeo> will be available for purchase during the opening reception on March 11, 2015 (6:00 – 8:00 PM). 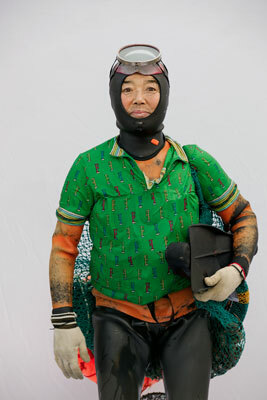 Haenyeo are females whose job is to harvest seafood, while controlling breathing without any apparatus. The discovery of knives and arrowheads made from abalones in prehistoric artifacts, provides proof that Haenyeo have a long history. They realized that the sea is a subject to be tendered and preserved, instead of being mass harvested. The knowledge and wisdom they obtained has been passed down to future generations. 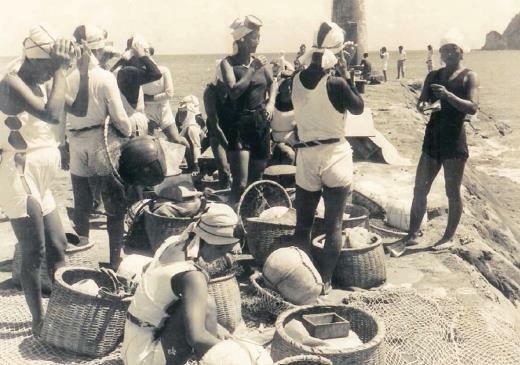 They accumulated harvesting skills and marine knowledge by adapting to the ocean environment. They are also known as Eco-Feminist because they played a major role in supporting the family. Their example helped improve the equality of the sexes by forming a powerful women community. 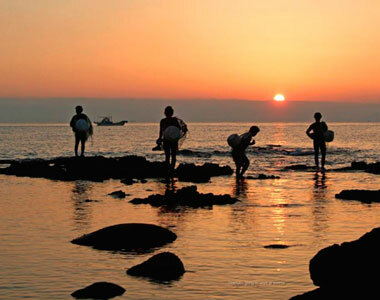 Jeju Haenyeo make their living by harvesting abalones, conches, sea cucumber, and hijiki from the ocean. They are called Jamsu, Jamnyeo and Jamsu in Jeju. Their lives are an integral part of the history of Jeju. The job they do in the sea is called ‘Muljil’. 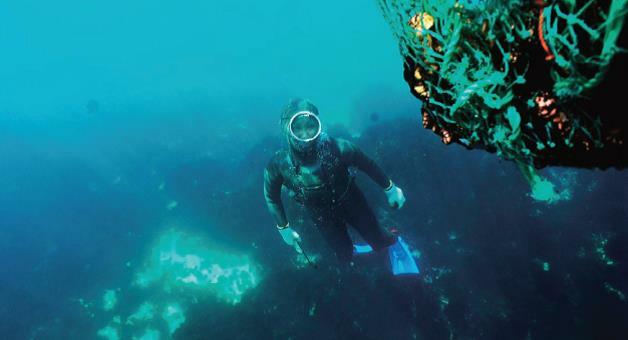 Diving seems to have begun before the period of the Three States, judging from the fact that Jeju had a record of contributing pearls to the King. 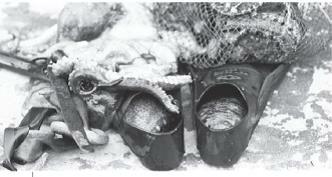 It is believed that fishermen harvested abalones and presented them during Josun dynasty. 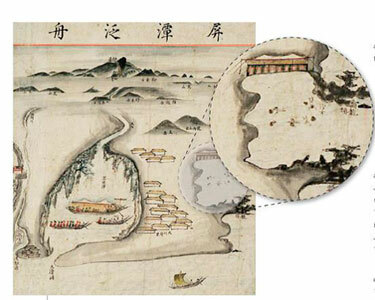 Jeju topography written by Lee Gun in 1629 recorded that Haenyeo harvested abalones. The records of Haenyeo are recorded on the Joseon Dynasty, Jiyoungrok written by Lee Ik Tae, and Jonjaejeonseo by We Baek Gue. 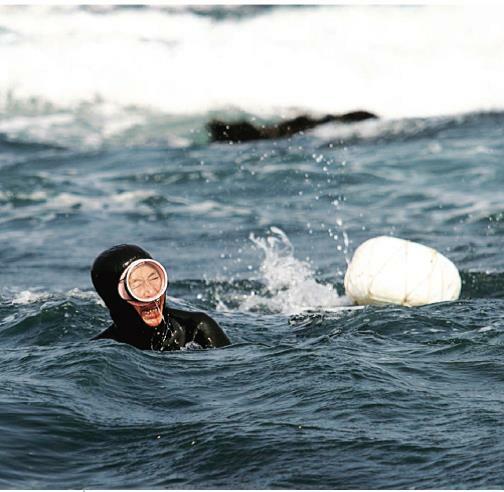 Jeju women are as diligent as men and learn early how to swim. They begun swimming at 7~8, and were very skillful in Muljil by age 18, and excellent and superior Haenyeo by age 35. They are considered rare women and attract a lot of attention from around the world. Muljil skill is accuired by lengthy training and experience. HaeNyeo near the ocean learned how to swim and dive in the shallow sea at the age of 8 and became baby HaeNyeo at age 15. Physical conditions such as lung capacity, ability to withstand pressure, and capacity to adjust to cold water are needed. Cool nerves are also necessary when swimming near and encountering big fish. Jeju Haenyeo have extended their skill and wisdom by learning the effective use of physical strength and knowledge of the ocean from the seniors at the Bulteok. Sumbisori is the whistling sound Haenyeo make when they surface. It sounds like a ‘Hoowi Hoowi’ sound when they inhale oxygen and exhale carbon dioxide created when submerged for 1~2 minutes. Sumbisori provides fresh air to Haenyeo and enables them to work extended periods of time with only short rest periods needed. Traditional outfits which are called <Mulot> are composed of three pieces such as <Mulsojungi> meaning pants, <Muljeoksam> meaning jacket, and <Mulsugun> tying hair. Mulsojungi which is made of cotton is designed for minimizing the water resistance to work well under the sea. 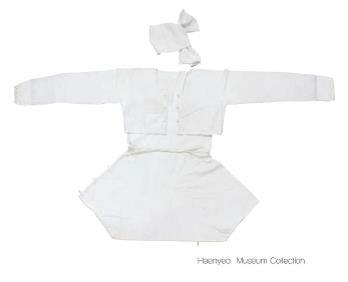 It has a side opening for HaeNyeo to change clothes without showing their body. 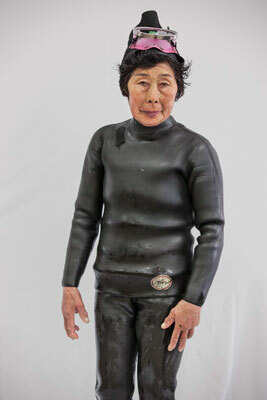 The distribution of rubber diving suits has greatly increased HaeNyeo’s income since their application in the early part of 1970. Diving equipment includes swimming goggles, Tewak Mangsari, Bitchang, and Kakuri. Swimming goggles have been used since 19th century. The Tewak can be clasped to their chests as a floating device while swimming. The Mangsari can be hung on the Tewak to store sea products that they have harvested. Bitchang, metal tools, is used to pick up abalones attached to the rock. 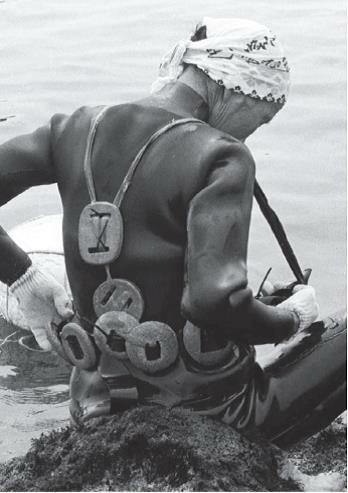 The Kakuri, considered the most useful tool for the divers, is used to pick up sea products between the cracks in the rocks, turn the rocks, move to another place and pull their body by attaching it to the rocks under the water. 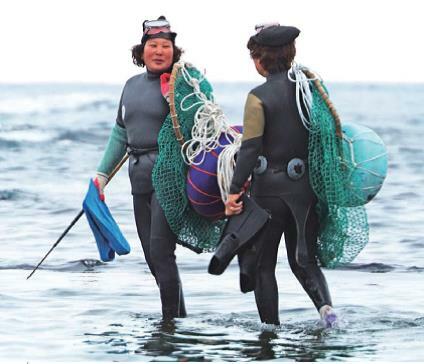 Jeju province desinated 15 items of swimming suits and diving equipment as folk material, number 10. Click Here to download HaeNyeo publication .